Thank you to all who supported this year's magnificent dinner on Sat. Nov. 3rd! It was grand! Sauerbraten Dinner, Saturday, November 7th, 2015. Serving started at 5:30 for this traditional home cooked three course meal. This was a by-reservation-only event, and we sold out! On October 11th 2014 we held our 2nd Sauerbraten Dinner with servings at 4:30 pm and 6:00 pm. Once again the dinner received rave reviews with thanks to all who attended and to the dedication to detail of the many people who helped prepare and serve. 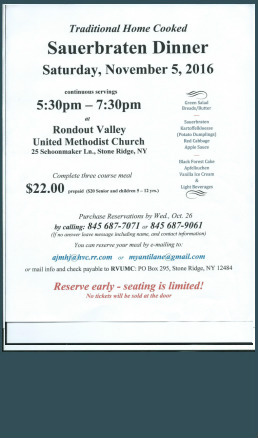 November of 2013, RVUMC held its first Sauerbraten Dinner. The three course dinner began with green salad and breads, continued with authentic recipe sauerbraten, kartoffle klosse, red cabbage and apple sauce, and finished with black forest cake, apflekuchen or vanilla ice cream. Beverages included coffee, tea and punch. The dinner received rave reviews by those who attended.